I've been in a preserving craze this summer. I'm stockpiling all sorts of jellies, pickles and syrups which I'm going to give as gifts this Christmas. One of the things I preserved was jalapeno jelly with raspberries. I broke open a jar today and decided to try it on salmon. Heaven. Pure heaven. You need to try this -- it's super simple and you can used a purchased jalapeno jelly if you don't want to make your own. Line a baking sheet with foil. Place the salmon on the foil lined baking sheet and sprinkle both sides with salt and pepper. Place about 3 tablespoons of the jalapeno jelly in a small glass dish and microwave for about 30 seconds to melt. Brush the jelly over the salmon. Place the salmon on the middle rack of the oven and broil for 4 minutes. Remove the salmon from the oven and turn using a spatula. 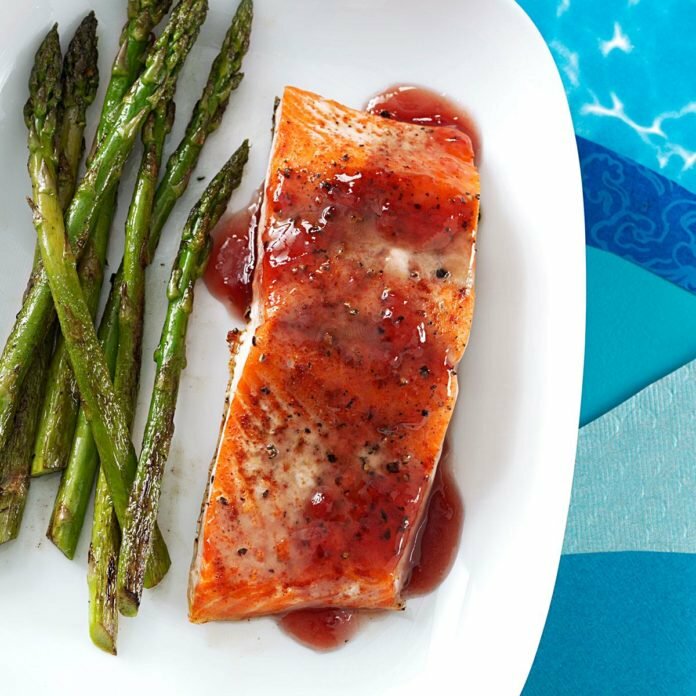 Brush the salmon with the remaining jelly and return to the oven for 4 to 5 minutes. Remove from the oven and carefully check to ensure that the salmon is done to your likeness. Use any leftovers in scrambled eggs for breakfast. Yum!